Due to changing reservoir parameters, oil and gas production flow rates and characteristics change during the life of a well or field. In many cases these changes cannot be accommodated by the original production system or infrastructure, which could limit production potential. Expro’s production enhancement systems are designed to maximise the production of hydrocarbons from wells in later life, revitalising them to allow production by overcoming system limitations or barriers. Well unloading units or low pressure systems are used to extend the life of wells with pressures that are lower than production system or pipelines allow for. Typically this will enable idle wells to produce and lazy wells to be unloaded at low pressure before returning production at sustained higher pressures and rates. Seawater injection systems are used to maintain or increase reservoir pressure to augment primary, secondary or tertiary recovery methods. In addition to pumping equipment, we supply water treatment systems and monitoring programmes to ensure that the quality of water being injected meets regulatory requirements. Produced injection water systems are used to reduce the burden of increased water cut on a production facility or pipeline. Complimentary separation and treatment systems ensure the quality of the water being injected meets stringent regulations associated with produced water disposal. The produced water can also be used as a component of a secondary recovery, water flood or reservoir pressure support program. Gas injection systems can be used to supply gas for pressure support in the reservoir or gas lift injection to improve or enhance production from individual wells. Production enhancement requires a comprehensive understanding of reservoir, wellbore and surface process facilities and pipelines. Expro can provide expert reservoir and subsurface engineering support for this. Process equipment is sourced from existing inventory where possible, configured offsite and requires minimal construction of site piping and ancillaries to complete onsite installation. Our customers benefit from in-house manufacturing facilities, process, engineering, and construction expertise, allowing us to manage the supply chain to achieve fast-track delivery of projects in a matter of months. Expro adds further value by offering production enhancement facilities on either a lease or sale, operate and maintain basis. 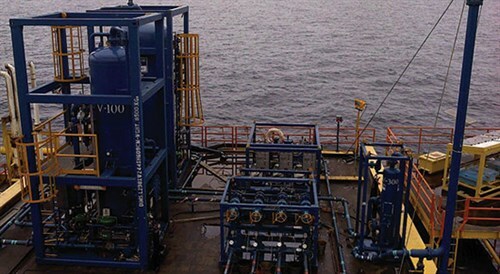 With a track record spanning over 30 years with production facilities in over 30 countries and in excess of 350 million barrels of oil equivalent produced, Expro is a leading global supplier of fast-tack modular production enhancement systems.